This post was originally published in The Engine Room. In Peru, the economy is booming thanks largely to multi-billion dollar mining efforts. As miners and drillers start new projects, what’s the impact on people who live near them? One issue is contaminated water sources linked to illness and death. In the Peruvian Amazon – and in other parts of the world – how can individuals hold the extractive industries accountable for the impacts – poisoned water, food, and heightened conflict are a few examples – of its activities? One project, called La Cuidadora, provides an information sharing network to assist indigenous communities in better protecting them selves from these impacts. 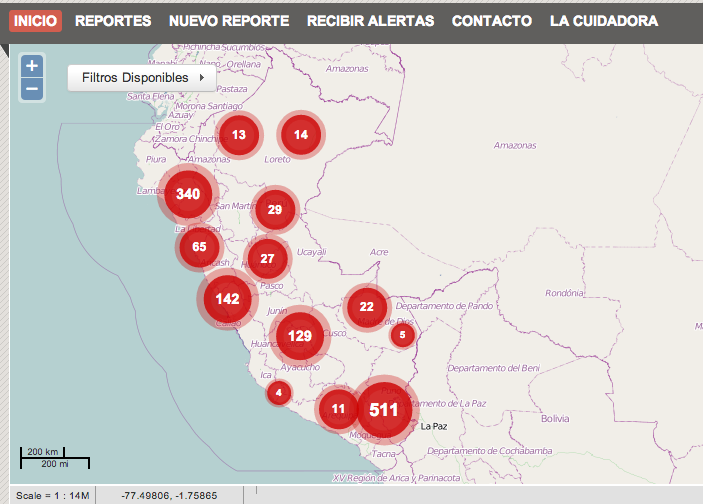 Using a Ushahidi deployment (translated into the indigenous language Shipibo), information from within affected communities gets reported, mapped and then distributed out to national organizations and media outlets as well as back to people in the affected communities. To make this work, La Cuidadora relies on its relationships with community based NGOs like the Defensa Indigena and the Coordinadora Nacional de Derechos Humanos. Its reports have made their way into national conversations about controversial mining projects as in – for example – this Twitter exchange from a few days ago. I sat down with the founder, Jonattan Rupire, and asked him how he would expand La Cuidadora if he had more resources. He said he would turn it into a more systematized early warning system with trained Cuidadoras in each community. He’d choose villages located along the rivers that go from the top of mountains being mined to their base. A Cuidadora at the top of a mountain would detect contamination in the river and send a text message to Cuidadoras at a lower points. Upon finding out about contamination, village dwellers would have more opportunity to make sure that they and their neighbors avoided it. It’s great to protect individual lives from the daily impacts of mining and drilling, but how can this work also yield more transparency and accountability in the extractive industries? By scaling up the early warning system, La Cuidadora would be simultaneously growing its database of information and building a more powerful tool for advocacy. Including a component that provides immediate utility for community members – saving lives is a strong incentive for participation – dramatically increases the likelihood of success for longer term goals of advocating for better practices using data collected over time. Indeed, it makes a data collection process that does not provide short-term benefits to participating communities seem downright silly. The system outlined in the diagram above would be concretized into a distribution of open source software tools designed expressly for this purpose. Using this distribution, other communities affected by the extractive industries could more easily replicate La Cuidadora’s work. It would include the localizations of Ushahidi to indigenous languages, the taxonomy system, the structure of text messages sent among village leaders about contamination, and the SIM card apps and SMS gateways that worked best for the initiative..
Where else have early warning systems been combined with advocacy to bring about more transparency and accountability in the mining industry? Let us know in the comments.